Phew! I’m really tired dude, this month was exhaustive but I’m sure that was worth it! Our team worked hard and is still working hard on a daily basis on many improvements on the software, to deliver you a better product. And even if our June updates aren’t so cool as the previous ones, know that we’re preparing big changes and they will be live ASAP! 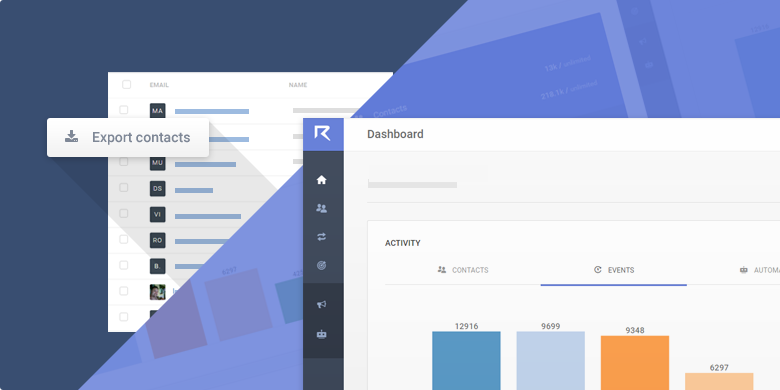 If you’ve accessed your Route account recently you already know that we’ve launched the Beta of our dashboard with general (but useful) information about your account. Why we consider our dashboard a Beta feature? Because we know that our users need a dashboard to understand what’s going on on their accounts, but we aren’t sure what’s the best data to appear there. We want to show you information that really will help you in your marketing strategy. We thought: “That the best people to tell us what is important are our users”. It makes sense, right? So, send us a message or leave a comment telling what kind of information you’d like to see in your account’s dashboard. We created it for ysou after all! Now in the contacts page, any search result or filter that you applied to your contacts can be exported as a CSV file with your contact’s email and name. It’s a way to get contact data from Route to use in other tools you have. Many people asked us for this feature, specially because the Conditions Engine on Route is very efficient. You can use it to generate some useful contact lists that you’d like to use in another software. It’s something really useful when creating custom audiences on Facebook for a really targeted Ad! So, just apply any kind of filter to display a specific list of contacts and click to export (at the top right of the contacts page) in order to generate the CSV file with the contacts info for you. We’ve worked hard to fix as many issues as possible in a month and deliver the best user experience for people using Route. Now our application looks and works better in different screens and we solved our speed problems. Yes, we know that many times our app doesn’t behave well and we count with your help to give us as much feedback as possible to improve it everyday. We’re always working on improvements, but specially this month and the next, we’re working on our infrastructure that you’ll let our customers reach higher levels in performance using our marketing platform. So, stick with us! While I’m writing this post, I realized that we’ve reached the middle of the year. Nothing really special happens at second semester, but for a supernatural reason people tend to be more optimistic. Enjoy this optimism wave and start today your marketing automation strategy with our help. It’s never too late to get all the benefits a Marketing Automation platform can deliver to your company. So, enjoy your second best time of the year to start using Route! Project manager, developer, startup founder and professor. Not necessarily in this order and not necessarily at Route.